Earlier this year, I introduced the Trent Dilfer Club - those quarterbacks for good teams who don't typically win games for their teams, but can often lose them. The Club members typically win by limiting their self-destruction and managing the game. This year, nobody followed this concept better than Alex Smith. Among QBs who played at least 9 games, Smith led the league with only 5 interceptions all year (and he played all 16 games!). He added a measly +0.01 WPA per game, but the 49ers entered the playoffs as the number two seed in the NFC with a 13-3 record. Smith did it both with his arm and his legs, putting up the game of his career. He posted a ridiculous WPA of +0.98, shattering his Dilfer-esque image. Dilfer's best game in that 2000 Super Bowl year was +0.33 WPA in a 24-23 regular season win over Tennessee. In fact, coming into this game, Dilfer and Smith's WPA numbers looked eerily similar. 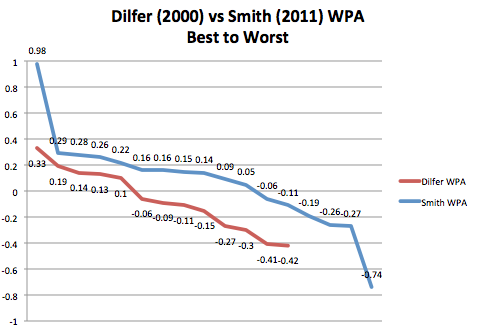 Dilfer averaged -0.07 WPA per game vs Smith's aforementioned +0.01. Their consistency was close too; a difference in standard deviation for WPA of just 0.035. Yet, there is no doubt that Alex Smith did more than just manage Saturday's win over the Saints. He was one of the primary factors in the win and finds himself as one of the four remaining quarterbacks in the 2011 playoffs. My hat is off to the guy who has had seven different offensive coordinators in seven years. The question remains, however, whether Smith will be able to bring home the same Lombardi hardware as Dilfer. And as an update on the original members of the Trent Dilfer Club, three of the four made the playoffs, but Smith is the only one left standing after the Patriots dismantling of Tim Tebow. Long live Dilfer. Somewhat off topic, but this has been bugging me since the game. So everyone knows Alex Smith should have taken a knee at the 1, or right after he got the first down on his run play. Thats obvious to even the dumbest of ESPN talking heads. But what about the drive after. Should Graham have taken a knee at the 1 when he broke away? I believe SF still had 1 timeout but it would have made them use it and given NO 4 chances to punch it in from the 1 yard line. Obviously no coach would have advised their player to not take the score there, but would it have been the statistically sound move? Also if Graham *had* taken a knee at the 1, and forced SF to burn their, I believe, last time out. Would it have been better to immediately start going for the TD, or take a knee on 1st down (and maybe even 2nd down) to burn down the clock. You said in another post that the end of the NO-SF game doesn't need more analysis, but I think you could definitely devote a whole post to NO's final drive. No disrespect, Keith, but the Trent Dilfer comparison has always been silly. While Smith may have added only +.01 WPA/G, his contribution was still positive. Dilfer, by contrast, was a net negative at -.07 WPA/G. Again, Dilfer was one of the worst QBs in football in 2000, when the Ravens won the Super Bowl. Smith has been about average or slightly above by most statistical measures. So, like I said, the comparison is silly. I don't think it was an unfair comparison at the time. 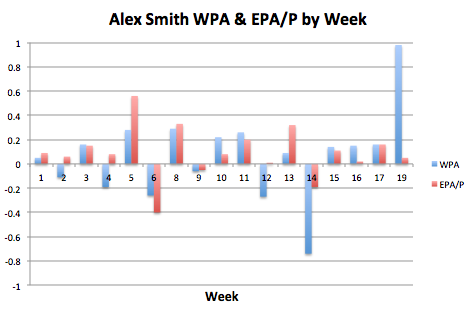 For the first time in his career, Smith finished a season with positive WPA and EPA. By no means was he previously considered to be winning games or a good quarterback in the NFL. Hence his recent success resulting in me shedding the comparison. I realize that Smith came out on the winning end of an amazing game and was a big part of both of their TD drives in the last 4 minutes, but did no one else watch the first 3 and a half quarters of that game? Outside of the 44 yard TD pass to Davis (Which was a 17 yard pick up before NO defenders decided to tackle each other), Smith's other TD came on a drive that started at NO's 4 yard line and beyond that if Frank gore wasn't moving the chains they were going 3 and out (or 3 and FG if their defense/STs had forced a TO in a good enough spot). I mean how does a defense force 5 turnovers in a game, and the opposing offense still runs over 70+ plays? Answer: Have Alex Smith throw the ball constantly. If 49ers had lost that game from either of the Saints last 2 TDs, it would have been 100% on Smith in my opinion. Saints won time of possession with 31:20 despite having 5 turnovers, 2 of which came on kick returns completing negating any saints possession time. San Fran had 1 turnover. Seriously, read the play by play of the game. On the last 2 drives he was 7/10 for 146 yards. Prior to that he was 17/32 for 153 yards (49 of which came on his TD pass to Davis). Completing just over 50% of your passes for less than 5 yards per attempt is terrible. He was also sacked 4 times and had 2 fumbles. I'm not trying to say he didn't have a great finish to the game, I watched it and it was amazing. But he did turn in a very Tebowesque performance and that doesn't shed the mold of a game manager in my opinion. How is 299 yds. on 42 attempts considered a great game (in this year's offensive environment)? For TRad and anonymous, I think it's somewhere in the middle. It was certainly Tebowesque in that his win probability added vastly out performed expectation based on his efficiency. That being said, he still came of big and is the primary reason for the Niners win (unlike most of Tebow's wins - most, not all - where there were exterior factors). And to see it as a great (and career game) for Smith, you have to look beyond basic stats like yards and yards per attempt. Both can be extremely misleading. It was a great game in the sense that Smith's late-game performance was key to the 49ers success, and his +0.98 WPA reflects that. Pretty big gap between WPA and EPA in that last game there. "Saints won time of possession with 31:20 despite having 5 turnovers, 2 of which came on kick returns completing negating any saints possession time. San Fran had 1 turnover". Now seriously. Smith was playing in the context of the team strength. He was asked to play _safely_. Vide the last play - "If Davis is free, hit him. If not, throw the ball away". Simply, safe, one option play. And Smith has succeed. What's more: after Saints _twice_ regained the lead - Smith has answered playing anything but safely. He had to take risks - and he delievered, again. Bottom line: it's not QBs who win the games. It's _teams_. QB is only a part of the team. And if e's doing what he is asked to do - he's OK. Yes, Brees has more "tools" than Smith, but so what? Smith ahs done more with his simple hammer than Brees with his whole toolbox. Keith, I have to call shenanigans on your rationale. Your original post on the subject didn't mention Smith's career or reputation. You expressly compared Dilfer's 2000 season to Smith's 2011 thus far. At the time, Smith's WPA was +.64, while Dilfer's through the same number of games in 2000 was -.57. That's a pretty big difference, so the comparison was misleading at the time you originally drew it. Look, I've been annoyed by people overrating Smith's accomplishments this year. But the Dilfer 2000 comparison is equally misleading and does not hold up to closer scrutiny. Like I said, the advanced stats say Smith's been average or slightly above, which is a lot better than Dilfer was in 2000. Agree with you bigmouth that Smith had a better season (both at that point and now) than Dilfer, which is why I didn't have him as the President of the club - not a perfect comparison obviously, and I doubt there ever will be one. That being said, he did not have a game over +0.29 WPA; he had not really won a game for the Niners. 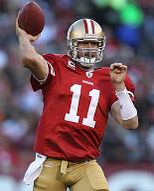 The Niners were winning because he wasn't making mistakes (and doing a better job of it than Dilfer ever did). What advanced statistic shows that Smith was "average or above average"? 16th in WPA, 21st in WPA/game. 14th in EPA, 17th in EPA/play. 1st in Int/att, Last in Sacks/Att. With the exception of interceptions, all I see is barely average or significantly below average. The best single measure is EPA/play, where Smith is a mediocre 17th. James, according to the majority of stats you cite, Smith ranks in the upper half of all QBs. Only his success rate and WPA/G rank him in the lower half. Additionally, Football Outsiders ranks him 13th in DYAR and 14th in DVOA -- again, both in the upper half of the league. You say Smith's been "mediocre," and I don't necessarily disagree. To my mind, that's the same as saying he's been about average, which is far more than Trent Dilfer could say when he won the Super Bowl in 2000.